Fever is rife right now, with Florence + The Machine having just completed their two headline theatre shows in Melbourne on Wednesday & Sydney last night. The two headline shows were touted as the hottest tickets in town given the intimate nature of these theatres versus the magnitude of this globally formidable act. On the eve of their headline performance at Splendour In The Grass this Saturday night, Laneway Presents are thrilled to confirm that this illuminating live act will be returning in November for a national tour in some of the country’s most glorious venues. Starting at Perth Arena on Saturday 7th November, then Melbourne’s Sidney Myer Music Bowl on Tuesday 10th November. Florence + The Machine will then perform two nights at the Sydney Opera House Forecourt on Friday 13th and Saturday 14th November, before heading north to Brisbane’s Riverstage on Wednesday 18th November, then finishing up in New Zealand with a show at Auckland’s Vector Arena on Saturday 21st November. 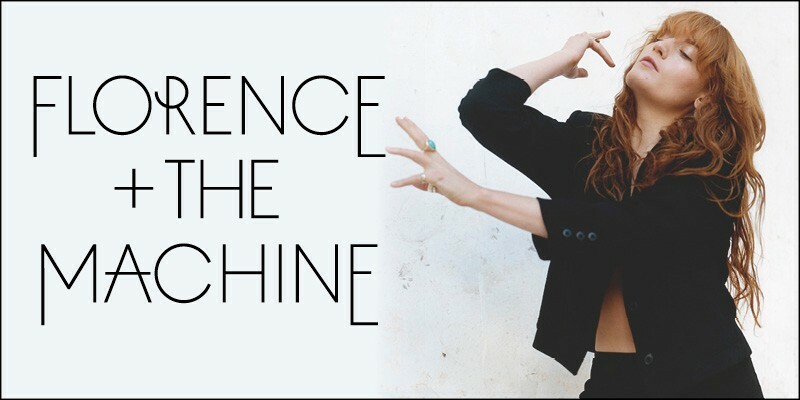 Back in April, Florence + The Machine’s Splendour appearance was confirmed, and fans were clamouring for news of sideshow appearances to follow. When the two theatre shows were announced and tickets sold via a ballot system; many were left empty-handed and eagerly awaiting news of further shows. The wait is now over and fans that missed out will now be able to see this enigmatic act on their return later this year. The third studio release from Florence + The Machine, ethereally titled “How Big How Blue How Beautiful”, has been met with glowing reviews and accolades from fans and media alike. Now certified gold in New Zealand, the album debuted at #1 on the NZ Recorded Music Top 40 charts and it has not left the Top 10 album chart since its release in May. The debut single, What Kind Of Man, was released with huge acclaim; a full-force anthem of uplifting defiance with an equally transfixing video that is more a short film, featuring dialogue about the unifying power of tragedy in a relationship . On theme with the first single, and part of a suite of narrative driven videos for the album, the follow up, Ship To Wreck, was released alongside a dynamic clip filmed in Florence’s London home . Already regarded as one of the most dynamic live entertainers on the planet, Florence Welch’s return to the stage this year has shown no downturn. So energetic and spirited was her headlining performance at Coachella’s first weekend this year, that she broke her foot. Ever the entertainer though, she not only still performed her second Coachella slot the following weekend, but brought one of the more passionate and fiery sets of the entire weekend – even though she was sat on a stool for the entire set.